All cars listed are standard gauge electric trolley cars except as noted. 2 DE DT AR wood line (ex-sweeper) trailer car (Brill, 1923 as C-125); ex-Philadelphia Rapid Transit Co./Philadelphia Transportation Co./Southeastern Pennsylvania Transportation Authority (to 1974)/ex-Pennsylvania Trolley Museum line car 2 (1974-2009); on Lake Shore Electric Railway flat car trucks; undergoing restoration. 7 SE DT GE all electric PCC (Minneapolis 326 194? ); ex-Newark Subway thereafter; complete; undergoing evaluation. 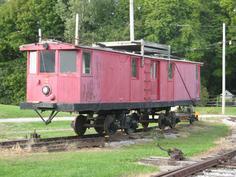 8 DE DT wood caboose (Delaware, Lackawanna & Western, 1914); ex-DL&W 614 (to ca. 1930) and ex-Genesee & Wyoming RR thereafter; complete and operational; undergoing roof and window repairs; not on display. 21 DE 4-wheel wood hand powered track car from the Grasse River Railway in the Adirondacks (unknown builder, ca 1900; rebuilt ca 1984). The unit is almost complete - the brake rigging is missing. It is on display in the car house. 34 DE ST AR wood snow plow (Brill, 1905); ex-Hornellsville Electric Rwy. (1905-1910) and ex-Hornell Traction Co. (1910-1926); unrestored car body with no equipment; stored inside main car house on shop truck. 107 DE DT RR wood interurban car (Jewett, 1911); ex-Elmira, Corning & Waverly Rwy. (1911-1930); mostly complete, but partially disassembled; car body displayed on original trucks in car house. 157 SE DT AR steel interurban car (Niles, 1914); ex-New York State Railways, Rochester & Eastern Line (1914-1930); car body on Baldwin trucks; partially restored; displayed in main car house. 168 DE DT AR steel interurban cars (built by Brill, 161 in 1927 and 168 in 1929) ex-Philadelphia & Western RR, ex-Philadelphia Suburban Transportation Co. and ex-Southeastern Pennsylvania Transportation Authority (1927-1990); ex-Keokuk Jct. Rwy. (1990s); brought to NYMT in 1996; both cars are operational and are positioned for service in the new car house. 162 DE ST AR wood city car (Stephenson, 1891); ex-Rochester Railway Co (1891-1909); converted to a work car in the early 1900s; ex-New York State Railways, Rochester Lines (1909-1938) and ex-Rochester Transit Corp (1938-1941), last nod. 0243; carbody and McGuire Cummings Columbian truck disassembled, car frame reconstructed; all components present; displayed in main car house. This car's truck is the last extant Maguire Columbian truck anywhere. 206 SE DT RR wood interurban car (Niles, 1908); ex-Buffalo, Lockport and Rochester/Rochester, Lockport and Buffalo (1908-1931); shed at Knowlesville, N.Y. (1932-1999); at Rochester and Genesee Valley RR Mus. (1999-2009). Has Chicago Transit Authority 4000-series motor trucks (Baldwin, 1920s); car body in storage on blocks outside under tarp. 319 3-wheeled Velocipede displayed in car house. 409 SE DT AR wood interurban motorized trailer (St. Louis, 1919); ex-Northern Texas Traction Co. (1919-1934); restored car body with replacement trucks in storage at NYMT; carbody displayed in car house. 437 SE (originally DE) DT DR wood semi-convertable city car (Kuhlman, 1904); ex-Rochester Railway Co. (1904-1909) and ex-New York State Railways, Rochester Lines (1909-1936); unrestored car body on replacement Brill 77E trucks; on display in main car house. 1402 SE DT CD DR wood city trailer car (Kuhlman, 1904); ex-Rochester Railway Co. (1904 - 1909) and ex-New York State Railways, Rochester Lines (1909 - ca. 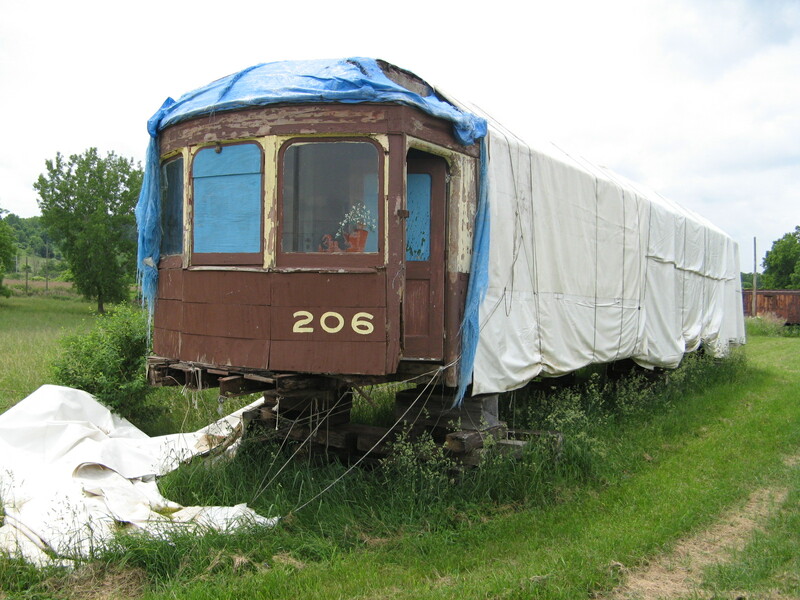 1935); built as DE DT DR wood open car; rebuilt 1914 to SE DT CD semi-open (enclosed; no window sashes); rebuilt 1920 to SE DT CD DR wood closed trailer car; unrestored carbody; stored outside under tarp near new car house. 01 Four-wheel gasoline-powered rail grinder trailer car (Fairbanks-Morse, 1960); ex-Genesee & Wyoming RR; complete but not operational; in storage at NYMT. 02 Four-wheel weed sprayer trailer car (rebuilt by NYMT from work flat trailer car, 1986); complete and operational; in work service on museum railroad. 03 Four-wheel flat trailer car (Built ca. 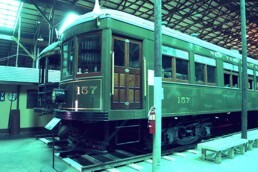 1940s; rebuilt by NYMT 2000 and 2008); previously used at NYMT as a reel car, 2000-2008; complete, operational and in workservice on the museums' railroad." 04 Four-wheel reel trailer car (NYMT, 2006). 021 Four-wheel tower trailer car (Built by Cleveland Transit System shop forces from older cars and tower parts, ca. 1953-54); ex-Trolleyville, U.S.A./Lake Shore Electric Railway, 1961-2009; complete and operational. C-130 DE DT AR wood snow sweeper (Brill, 1923 as snow plow E-217; rebuilt by Brill in 1925 as snow sweeper); ex-Philadelphia Rapid Transit Co./Philadelphia Transportation Co./Southeastern Pennsylvania Transportation Authority (to 1974); trucks re-gauged from 5' 2¼" to standard gauge at NYMT ca. 1976; complete and nearly operational; displayed in car house. L-2 0-4-0 gasoline locomotive (Plymouth, 1937); ex-New York State Railways, Rochester Railways (1937-1938) and ex-Rochester Transit Corp. (1938-1958); disassembled and partially restored; stored in car house. TC-1 Four-wheel gasoline track car (Fairmont, 1945); complete and operational; in regular passenger service on museum railroad with unnumbered passenger trailer car. No # Four-wheel gasoline "Casey Jones" track car (Northwest 1927); ex-New York State Railways, Rochester Lines (1927-1938) and ex-Rochester Transit Corp. (1938-1958); used in Rochester subway service; recently restored and operational; operated occasionally on museum railroad and routinely on display in the exhibition hall. No # Four-wheel passenger trailer car (rebuilt by NYMT from work flat trailer car ca. 1980); complete and operational; in regular passenger service on the museum railroad with TC-1.